It’s that time again. Time to share yet another sneak peek recipe with you from my upcoming cookbook, Juli Bauer’s Paleo Cookbook! Last week I shared one of my favorite savory breakfast recipes from the book, Apple Fennel Breakfast Sausage and this week it’s all about dinner. In the summer, I start to run out of ideas about what to cook. It’s usually something on the grill. Or salmon. And since we don’t have a grill right now, it’s all salmon. Which is cool and all, but I need more excitement and flavor. That’s where this recipe comes in to play. 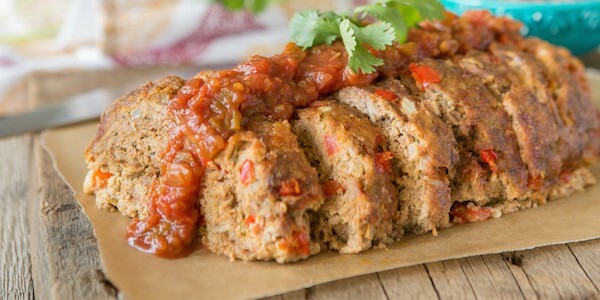 This meatloaf is FULL of flavor. Because you can make it into any flavor you want. Maybe you want sweet and savory, so you use a peach salsa. Or maybe you want super spicy and use a habanero salsa. Seriously, you can make this recipe taste however you’d like, but I can promise you it will taste amazing every time. If you hadn’t noticed yet, which means you are blind, this recipe along with the breakfast sausage recipe both have absolutely amazing pictures. That’s because I did not do them. I’m not exactly strong when it comes to my photography. Because I don’t give a sh*t. I really should learn how to use the nice camera I have, but I would rather spend my time doing other things. Like cooking. Ok, let’s be real, like eating. But when I decided to write this book, I wanted it to be exactly what I envisioned in my mind. And my own photography was NOT what I envisioned. I envisioned recipes that made you feel like you were at your dinner table, about to eat. I envisioned brightness and color and flowers. And that’s exactly what I got when I decided to work with Bill and Hayley from Primal Palate. When I was looking for a photographer, I looked to them for advice. I had no idea what to look for since I had never worked with one before. Right away, they offered to help, because that’s the kind of people they are. They welcomed me into their home, into their guest room, into their kitchen, and into their lives. It took me 4 trips to Pittsburgh, all lasting at least 7-10 days, to create this book. That means they put their lives on hold for 7-10 days at a time, all to help me out and help me create my vision of this book. How amazing are they? Super amazing. When I wrote my first cookbook, I honestly had no idea what I was doing. I call it my high school book, just really getting my feet wet. My second cookbook was still a learning process; still finding out who I was and what my vision really was, also known as my college book. And my newest upcoming cookbook, this is my grad school book. I finally know what I want, I’m better at what I do, and I have a vision of what I want to put out into the world. This book has the most beautiful photography of all my books, the best recipes I’ve ever made, and my honest and happy viewpoint on paleo. I’m continuously trying to get better at everything I do, and I think it really shows in this book. Balls, I’m so excited for you all to see it. And while you’re testing this recipe out to see what you think, remember that my new book, which comes out in less than 5 weeks, is now only $18.30 on Amazon. That’s marked down from $34.95, meaning it’s 48% OFF!!! With Amazon, we have no idea how long that deal will last or when it will go back up, but I can promise you that if you preorder it now, you’ll seal that deal before it increases again! So awesome it’s so dang cheap right now! And if you’re worried about having all the ingredients for my new book, don’t forget to sign up for my latest giveaway with Thrive Market! Who wouldn’t want an extra $250 towards ingredients?! Now go eat this! Don’t question it! Do it!! Preheat the oven to 350°F. Grease a 9 by 5-inch loaf pan. In a large bowl, combine all the ingredients except for the salsa. Press the mixture firmly into the prepared loaf pan. Pour 1 cup of the salsa on top of the meatloaf. Bake for 1 hour 15 minutes, until the meat is completely cooked through in the middle. 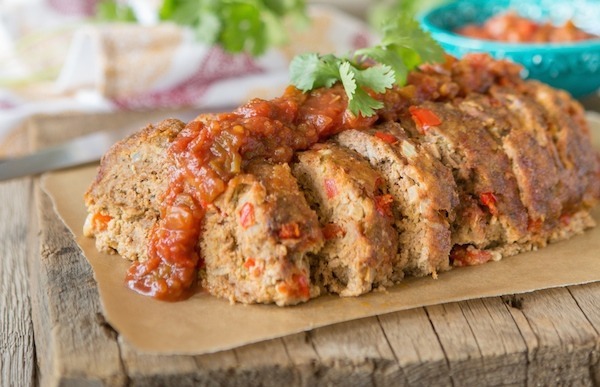 Remove the meatloaf from the oven, top with the remaining 1 cup of salsa, and garnish with extra cilantro. 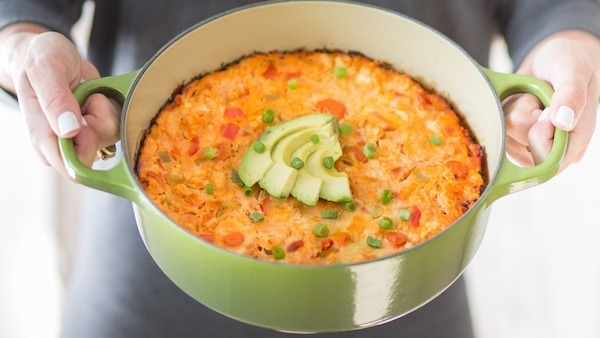 More Previews From Juli Bauer’s Paleo Cookbook! 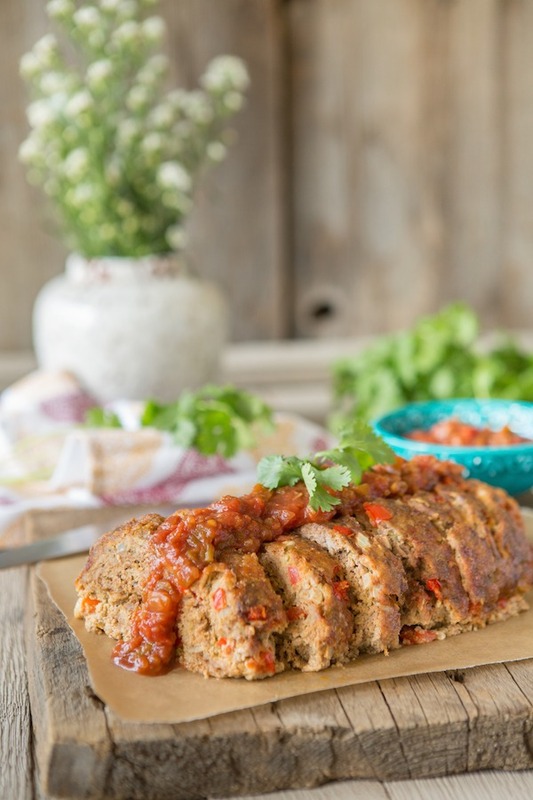 I love your Southwest Meatloaf and make it at least once a month. But this meatloaf, this looks off the charts. Definitely going to be making this in my near future. Thank you for being you! Ahh! All the pictures are amazing! Cant wait to try this recepie! LOL, the pictures are beautiful, but they look nothing like my dinner table :) Where are the paper towel napkins and baby food puree slathered about? I love meatloaf! It’s an all-time comfort food for me. I also appreciate the “choose your own adventure” salsa options. It’s nice to diverge from the standard ketchup topping once in a while. yay!! glad to hear it! Just one question…. What do you do with the Chorizo? Do you chop it or mince it? Here in Spain, it comes as a long hard sausage. What is “blanched” almond flour? Thanks. This looks wonderful! it’s almond flour, just a little finer. what kind of chorizo do you use or like? This was delicious! I used green bell pepper and doubled up on some of the spices and it was great. However, it took closer to 1.5 hours in the oven and it’s not quite done yet. (I am planning on reheating this for lunch later in the week, though, so it works for me. Is it possible to substitute coconut flour for almond flour? Would it keep okay to make this ahead of time? Say, early afternoon prep for a 7pm dinner? I wasn’t able to find ground chorizo at the store so I bought the sausage and just removed the casings and chopped it up and it still seemed to work great! Yup! Just ordered my copy from Amazon! Julie, I am so excited for your book. Your cooking, workouts, and stories have inspired me so much and I have tuned a huge corner in terms of wellness and a lifestyle approach, not trying to be “perfect” anymore. Anyways, THANK YOU and so excited to cook and eat my way through this book! Yayyyyyy!! you are the greatest! Thank you so much for the support, hope you love it! Delicious! Made this last week and the whole family loved it! I had to sub spicy Italian sausage for the chorizo because I was having a hard time finding it, but it still came out great. I will definitely be making this more regularly! I love this recipe! It reminds me when I was young and my mother used to bake a similar loaf. May make a couple of suggestions? Variations if you will? – i press the meat until it’s about an inch thick. then i add 2-4 hard boiled eggs (depending on how many people are eating) in a straight line in the middle. – then roll the load and tuck in the edges so the eggs are completely covered from all angles. – to keep it all together in the oven i’ll take very thinly sliced tomatoes and cover the whole loaf after it’s on the baking sheet. This was amazing Juli! I subbed dried mushrooms for the almond flour (trying to avoid eating too many nuts) and it turned out so yummy! Thanks for all of the delicious recipes. You are seriously the cutest! That sounds really yummy. Do you mind sharing how much dried mushroom you used? I’d love to try it! This meatloaf was amazing! Definitely making this again! Didn’t have almond flor so I had to use cashew flour… Not sure if it made a difference. Thank you! I’m about to pre-order your cookbook. Thanks again for the sneak peak recipe???? This looks yummy, but what could I sub for chorizo as I am not a fan of it? Thanks. This may be a duplicate comment – sorry if it is. This was super tasty! And easy. However, It really seems like it should be more than 6 servings. It’s alot of meat. I cut my loaf into 6 slices, and there was no way I could finish one slice! It’s very hearty. Otherwise, very tasty and fun alternative to normal meatloaf. Not to sound like an idiot, but is there a substitution for the chorizo? I live in VA and have found it difficult to get chorizo here. The kind I do find is in sausage links. Perhaps other suggestions? if they are raw, you could remove it from the casing. if not, just use ground beef and add some extra spices to it! This is delicious!!! 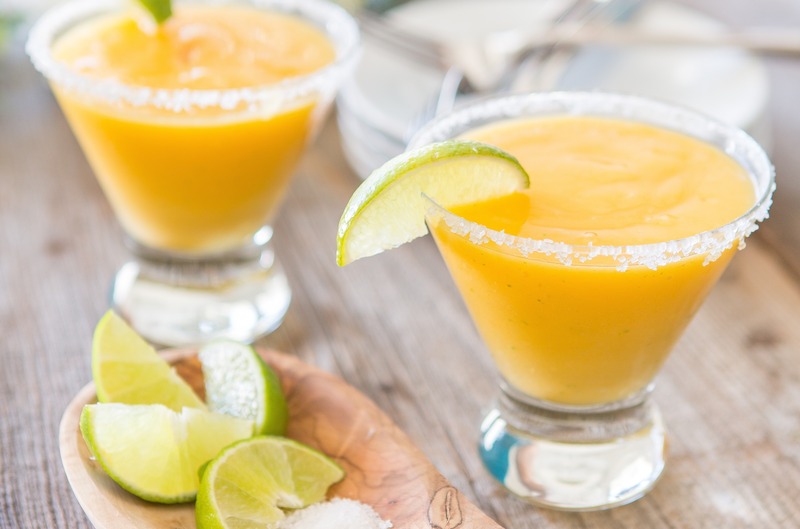 Easy to make and totally husband approved. 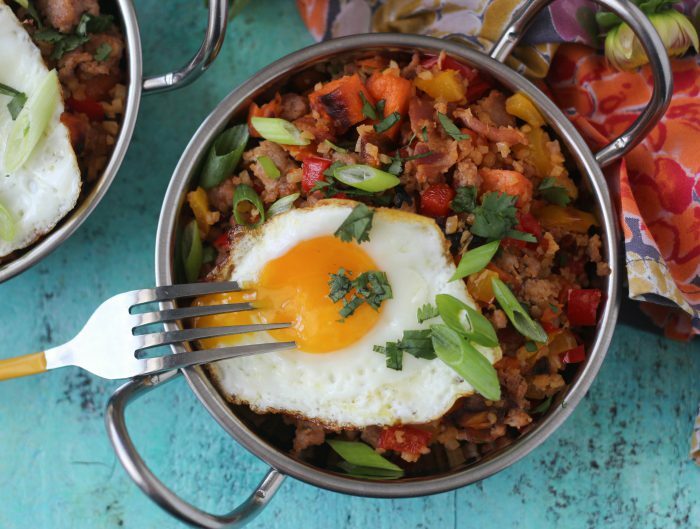 The mix of ground beef and chorizo is perfect and gives it a little kick. I will definitely be making this again! 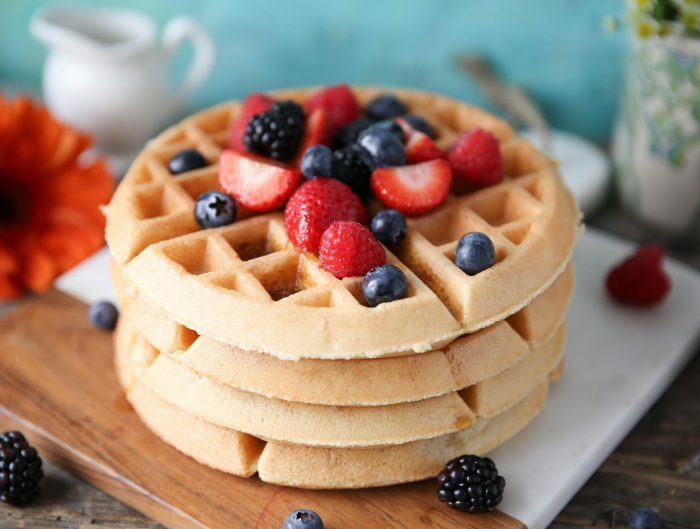 What is the cooking conversion time to make this in a muffin pan? Yummmmmm!!! 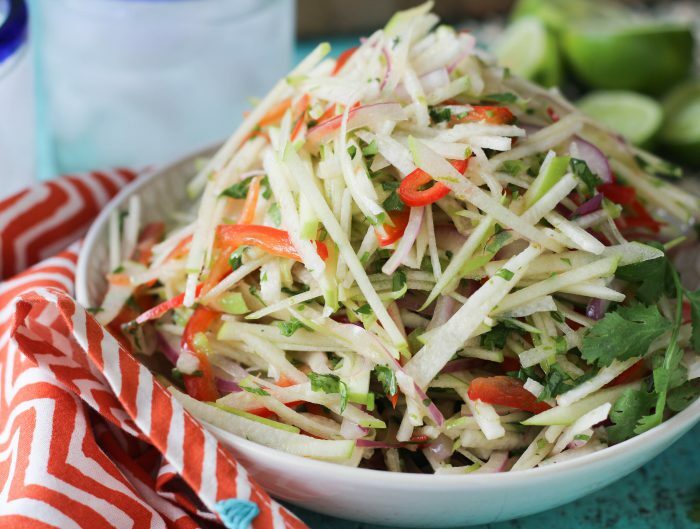 You have done it again, another paleo recipe that my husband LOVES!!!! He want’s me to add it to the ‘list’ and even took the leftovers for lunch. You make healthy easy and soooo yummy, LOVE IT!!!! This recipe is da bomb! I finally got around to making it and am so sad I waited this long to get my act together. I cooked mine with regular salsa and then topped it with peach salsa like you suggested in your cookbook and am so glad I took the peach salsa risk! Keep up the amazing work! This has become a family favorite! We love this recipe. The only thing different is I use a buffalo chorizo. This tastes amazing! Thank you so much for sharing! Making tonight! Do you drain can of green chilies? !